Every so often someone asks me who buys electric bikes in the Netherlands. My usual answer is that they are bought by the elderly (Dutch over 65s make 24% of their journeys by bike) and by people with a disability who need a bit of assistance. This short article appeared in the September issue of Tweewieler magazine. A magazine for the Dutch bike trade, which is distributed to bike shops. The title of the article reads "Modern e-bike gets still younger buying public"
There was an online survey of 500 people organised by the Dutch "Halfords" chain of shops (I understand this is no longer connected with British "Halfords"). The survey produced such results as that 37% of correspondents said they wanted an electric bike to make cycling easier. A representative of Halfords claims that the average buying age is creeping down to around 50, which is much lower than previously, when most were bought by 65+ers, but do bear in mind that he's a salesman. The article also mentions that they often see couples buying his and hers bikes together. This is something I've noticed in the past. Dutch couples who buy identical bikes at retirement so they can cycle together. The two bikes on the right in the photo are near identical models which were probably bought by a couple. The bike on the left with the number plate is an older style of assisted bike with a petrol engine. 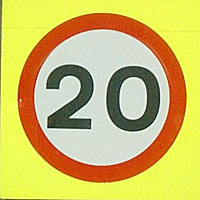 These are also limited to 25 km/h, so they were bought by very much the same people as now buy electric bikes. Part of the growth in electric bike sales is due to these types of low power motor bike having been replaced by electric bikes. Much has been made in some quarters of the number of electric bikes sold in the Netherlands. This article gives a figure of 5000 electric bikes sold in the country last year, with an expectation that this may have doubled to 10000 this year. Impressive growth, but still small numbers compared with the 1.3 million bikes sold per year in the Netherlands. The reason for the high monetary value of electric bicycles is that when people buy electric bikes in the Netherlands they tend to buy expensive ones. Also, because it's quite common for older couples to buy identical "his and hers" pairs of bikes as in the photo, this in effect doubles the amount spent. I've used a few videos before from Mark Wagenbuur who lives in 's Hertogenbosch ("Den Bosch" for short). This is a Dutch city in the southern province of Brabant. It's another "normal" Dutch town with a normal level of cycling. 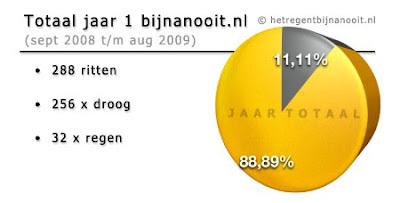 "Maybe I can add even more background information: Den Bosch (capital of Brabant with currently 137.777 inhabitants) has the ambition to increase cycling from 33% to 44% of all trips. It has freed a budget of 3 million Euros per year until 2012 to improve cycle infrastructure (for separate high quality cycle routes, tunnels etc) and then another 1.5 million Euros per year until 2015. A total of 16.5 million Euros! There will also be campaigns to win people's minds for cycling. And the city means business: building is going on all over the city!" And of course this is the way to do it. 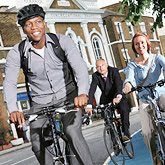 Increase the convenience, safety and pleasure of cycling and people cycle more. It's a story which is repeated all across the Netherlands. I covered before the fears of a shortfall in railway station parking in the Netherlands. There is actually some very good news that has come out of this. The national railway company is promising to build 100000 (one hundred thousand) additional cycle parking spaces across 150 stations. That's an average of 666 extra cycle parking spaces per station. They're also promising longer opening times for the guarded cycle parks, more cycle shops at railway stations (they do repairs while your bike is parked), improved wider cycle racks, that they'll be more active at removing abandoned bikes, and that there will be a lick of paint and other maintenance for existing cycle parks. All this will take about five years to happen. The question which remains is "is this enough ?" Let's hope it is. Now, an average of 666 extra spaces per station. How does this compare with elsewhere ? To give an example, the number of extra spaces being installed in just five stations is more than the total parking at all 50 railway stations in London. It also compares very well with the amount at other places in the UK. There are quite a lot of cycle parking articles. How many cycle parking spaces do you have at your local railway station ? Thanks to Frits for pointing this article in the latest copy of "Spoor", the Dutch Railways magazine. The village of Vries is about 8 km North of Assen. It is a village of fewer than 5000 people. There is no secondary school in the village so most children of secondary school age in the village cycle each day to Assen to go to school. The school which is the shortest distance from the centre of Vries is on the Groningerstraat in Assen, around 8.5 km (5.25 miles) South. Not all of the children attend this school, some of the others go a few km further into Assen and some ride in the opposite direction to Groningen, about 18 km North of Vries. Some children sometimes ride a bus, but there is no "school bus". The schools do not have drop off zones for parents to deliver children by car, and arriving at school by car is extremely rare. These children predominantly cycle to school, as is the case all across the Netherlands. The cycle path provided for this route is of very high quality and encourages cycling. I covered this cycle path before. 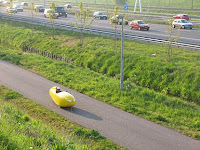 It also forms part of the route of my commute to Groningen. Even though in this case the driving route and cycling route are the same, cyclists only go through two sets of traffic lights, while drivers go through four. The difference was explained in a previous post. 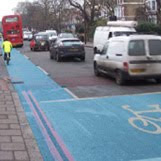 If you want to encourage a higher cycling rate where you live, this is the standard of provision to aim for. Not only do children cycle in greater numbers here than elsewhere, but the same is also true of the entire population. The degree of subjective safety on cycle paths like those shown in the video is the reason why cycling here is so appealing. There are many other school travel stories, and don't miss the video of primary school children riding to school. Note that the google maps imagery of this route is a bit outdated, but what is on streetview is quite good. A Dutch blogger who makes a 36 km commuting round trip (40 minutes each way) by bike 3 to 4 times per week has produced a website called "It almost never rains". On this website he documented rainfall during his commute over the year from September 2008 to August 2009. Just 32 days out of 288 days had rain during his commute. The Netherlands is not the driest country on earth, but rain isn't a very good excuse for not cycling here.